My third contribution to this year's #GreatHallowTweet is a Spicy Bloody Mary. I love these. Love, love, love. And what could be a more sinister sounding drink? Huh? Halloween would not be the same without a little blood. ;) Enjoy! 1. Combine the vodka, tomato/vegetable juice, lime juice, worcestershire sauce and tabasco in a cocktail mixer. 2. Shake the mixture well and strain it into a hickory salt rimmed glass (filled with ice cubes, optional). 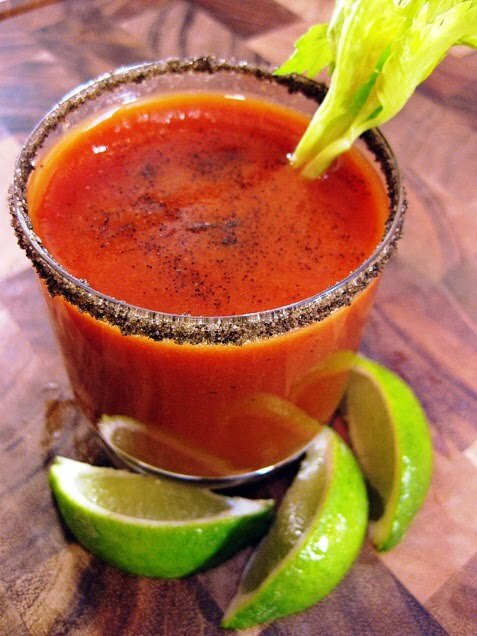 Garnish the Bloody Mary with the celery stick and a lime wedge. Spicy like you...this is irresistible! BOO to you today!! Oh Paula! Could I ever go for one of these right now! Great recipe! Only on of my favorite drinks on the planet. But you are missing freshly grated HORSERADISH! AHHH! Now I must have one. Bloody Mary's are one of my husband's specialties and his favorite drink (well, besides a martini). The hickory salt on the rim sounds like a great idea. He's sure to love it. Sounds delicious! Where on earth do you get hickory salt?? I want I want I want and right at this moment I most definitely need!